NEW ORLEANS – Led by the Columbia men and the Dartmouth women, the Ivy League is on the rise in the U.S. Track & Field and Cross Country Coaches Association (USTFCCCA) Division I National Coaches Polls released Tuesday. A win at the Notre Dame Invitational over seven other ranked teams boosted the Columbia men up 22 spots to an all-time program-best No. 8, while National Athlete of the Week Abbey D’Agostino led the Dartmouth women to a runner-up performance at Lehigh’s Paul Short Run to boost the Big Green from not receiving votes last week to No. 13 — their first national rank since 2002 and highest since being No. 3 in the preseason of 1998. For the first time in poll history, the Ivy League now has six teams between men and women in the polls, excluding final NCAA orders of finish. The 2001 NCAA Championships featured five women’s Ivy teams — Yale (13th), Columbia (22nd), Brown (27th), Dartmouth (29th), and Cornell (30th) — and one men’s squad, Dartmouth (30th). Joining Columbia from the Ivy League ranks in the men’s poll include No. 10 Princeton — down a spot after being defeated by Columbia at ND — and No. 27 Dartmouth, which returns to the poll after a runner-up showing at Paul Short. Dartmouth’s women join No. 15 Cornell — down five spots after being beat by Dartmouth — and No. 23 Princeton. Ivy League squads weren’t the only teams making significant moves in the polls this week. More than half of the combined spots in the men’s and women’s top-10s feature different teams from a week ago — including seven changes to the women’s top 10. The Notre Dame Invitational produced the two biggest moves into the top 10, as New Mexico nearly upset No. 2 Florida State to jump eight spots to No. 7, while San Francisco finished a strong third to leap 14 spots to No. 10, its first top-10 rank in program history. New Mexico’s Samantha Silva finished third to lead three Lobos in the top 11 and six in the meet’s top 35, giving the squad 82 points — just five shy of No. 2 Florida State’s 77. For the Lobos, this is the highest rank since week five of the 2011 season. San Francisco displayed similar depth, with seniors Bridget Dahlberg and Eva Krchova finishing seventh and eighth, respectively, to lead six Dons in the top 39. In terms of order, the top three remained unchanged this week as No. 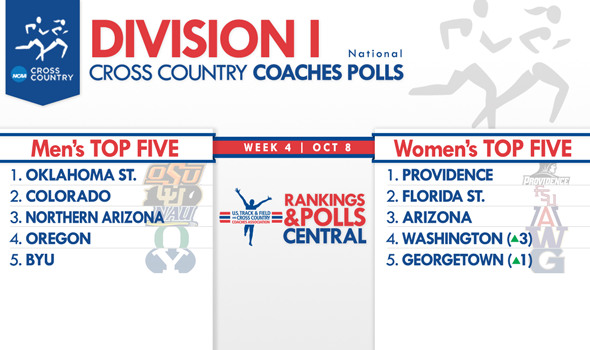 1 Providence leads the poll over Notre Dame Invitational champion No. 2 Florida State and idle No. 3 Arizona, champions at the Roy Griak Invitational a week ago. After nearly being defeated by New Mexico – now No. 7 in the poll — at ND by a winning margin of just five points, FSU was nearly overtaken in the poll with Arizona now just two votes behind. A move to No. 2 would have given the Wildcats their highest rank since, coincidentally, this exact same week last year. Washington moved up three spots to No. 4 after defeating defending champion Oregon on its home course en route to a team title at the Bill Dellinger Invitational. Oregon dropped one spot to No. 6 — its lowest since the end of the 2011 season, when it was 16th prior to a fifth-place NCAA Championships finish. Moving up to replace the defending champion Oregon at No. 5 was 2011 national champion Georgetown, as the Hoyas took the team title at Paul Short. Arkansas moved up one spot to No. 8 after posting a near-perfect score of 16 at its home Chile Pepper Festival, while idle Michigan State moved up to No. 9. The Spartans are a top-10 for the first time since week six of the 2008 season. San Francisco rounded out the top 10. Notably absent from the top 10 is Duke. After dropping to No. 3 in the Southeast Region Monday following a 10th-place showing at ND with only a few of its top runners, including individual winner Juliet Bottorff, Duke tumbled 13 spots to No. 17. The Blue Devils had been a top-10 team for the previous six polls, not including a seventh-place finish at NCAAs last season. Outside of Dartmouth’s ascent to No. 13 from being unranked, the big gainer in the poll this week was Ivy League rival Princeton, which jumped seven spots to No. 23 after a fifth-place team finish at Notre Dame. Unanimous No. 1 Oklahoma State was idle both in competition and in the rankings this week, heading a top six that did not change in order from a week ago; No. 2 Colorado, No. 3 Northern Arizona, No. 4 Oregon, No. 5 BYU and No. 6 Arkansas all remained stationary. The movement began at No. 7. A runner-up finish by last week’s No. 7 squad Tulsa dropped the Golden Hurricane to No. 9, while Portland moved up one spot to claim the seventh spot in this week’s poll. Ahead of the Golden Hurricane by virtue of their head-to-head win this weekend at ND is Columbia, which put its top five across the line among the top 24 in South Bend. Should the Lions hold on to a top-10 position through the end of the season, it would be the first time a Columbia squad has finished in the national top-10 since the 1938 outdoor track & field championships. The squad’s previous all-time high was No. 10 last year in week five. Ivy League rival Princeton rounded out the top 10, down a spot from last week following a third-place showing at Notre Dame. Other big gainers in the poll include No. 12 Indiana — up three spots to No. 15 after a team title at Paul Short — and No. 23 Villanova — up four spots after a runner-up showing to No. 6 Arkansas at the Chile Pepper Festival in Fayetteville, Ark. Joining the poll this week are No. 19 Boise State, which finished runner-up to Oregon at the Bill Dellinger Invitational in Eugene, Ore.; and No. 22 Minnesota, which took fourth at Notre Dame. The last time the Golden Gophers burrowed into the rankings was exactly one year ago in week four of the 2012 season. Returning to the poll is No. 27 Dartmouth, which has been absent since a rank of No. 29 in the preseason.